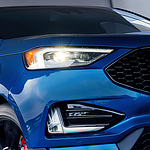 Have you seen the all new Ford Edge ST? It’s the upgraded, performance-enhanced midsize SUV from the American automaker, and it’s turning heads. While the Ford Edge is an excellent SUV, the Edge ST has won awards for its redesign and power, allowing for both comfort and performance. In fact, this latest edition has a twin turbocharged V6 engine that can put out 245 horsepower and 380 pound-torque. In addition, the technology package and safety range of the Edge ST is far above the other trims. You’ll be able to keep yourself in lane with lane departure assist, or even get alerts with blind spot monitoring. You can also see everything in your clear HD LCD display in the center of your dashboard that includes Ford’s exclusive SYNC 3 infotainment system. This uses Apple CarPlay and Android Auto to connect to your phone. Want to get the best deal on a Ford Edge ST? Then stop by West Herr Ford of Hamburg.